Hi… i’m wondering whats a good holster for a 9mm XD sub-compact to wear concealed.. I just got my conceal carry, and I don’t wear belts….any ideas.. This is a question that I get on a regular basis. First I have to say that were and how to carry is really a personal preference. 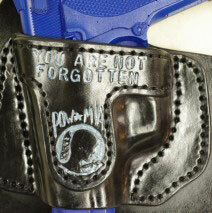 Any on body carry option will require a belt and any Inside the Waistband (IWB) holster will require larger size pants. This can be especially difficult for women because their clothing is not designed for this. Many of my female customers like the Invisi-Tuck IWB and others prefer the Paddle holster outside the waist band (OWB). I hope this was helpful.